** This article was written by Diane, and updated in April 2002. Abu Haroun, or ‘Bu,’ was born on April 17th, 1984. He is by Fane (Haroun) out of Royal Fiesta by Fari. From the day he was born, Bu has always been very cheeky, jumping over everything that gets in his way. Abu Haroun (Fane by Haroun x Royal Fiesta by Fari) shown above and at top of page, with owner and author Diane Volpe. 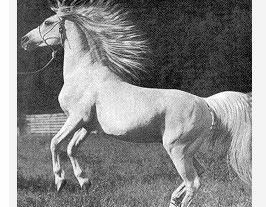 Bu was bred by Jane Fraser, and I purchased him with his dam when he was just a few days old. 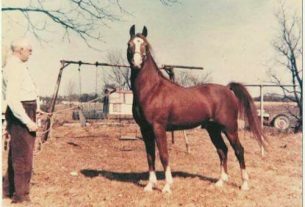 He was shown in hand with great success as a yearling and two-year-old, but we decided to have him castrated (that autumn), and use him as a ridden gelding. As a four-year-old, Bu won nearly every county show that he entered, and he de-noviced himself at his first show. Things went really well for Bu as a 5-year-old, winning the Kempton Arab National Show, Gelding under saddle, 2nd Junior Gelding in hand, plus he won the coveted Sam Simonds award for Best Small Stud. Not bad results in just one day! In 1990, Bu continued his successes under saddle and won the young riders class at the Arab National Show with youth rider Robert Lowe. In 1991 Diane gave Bu a rest year so she could concentrate on breaking in her Russian stallion Tantavitch. 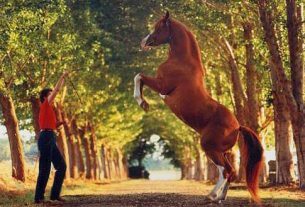 A wise decision as in 1992, Tantavich’s ridden career took off when he achieved Champion under saddle at the Royal Agricultural Show. However not to be left behind, Bu then went on to win the International Gelding Class at Towerlands, cementing a super year end for 1992. In 1993 Diane guided Bu to Champion under saddle at the Royal Show at Stoneleigh in a large class of 22. In 1994, Bu won Haydock Park in the combined ridden gelding and mare class, and was awarded Reserve Champion. 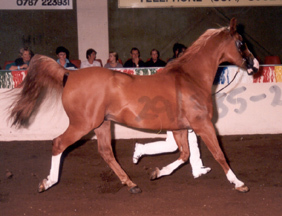 In 1995, he again won the Arab National Show, this time in-hand under judge Deidre Robinson. We won the ridden pairs at Haydock in 1996, with Anne Green on Khalif, so in 1997 Bu enjoyed a well-earned rest as Diane had several youngsters to show. 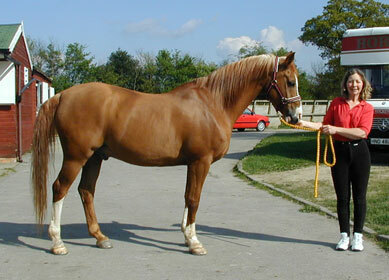 Come 1998, Bu amazed everyone at age 14 and won Three Counties Show at Malvern and several other awards. Training for endurance commenced in 2000, only to be stopped in February 2001, due to the Foot and Mouth outbreak. We did however manage to complete two 20-mile Bronze Buckle Qualifier rides at the end of the season, and have already finished two more qualifiers this 2002 season. The year 2002 has brought the new Endurance GB Society, and we have already completed several 20-mile Graded rides, and Bu achieved Grade l’s and a heart rate of 34. Not bad at age 18. He also completed a 30-mile ride and progressed to Intermediate class. In less than 6 months to April 2002, Abu Haroun has gone from Novice to Intermediate with Endurance GB obtaining 3 Grade 1’s on pulse and 1 Grade 2. As of September 2002, Abu Haroun has moved up to Advanced level. Hopefully Bu will continue to give pleasure for a great number of years, and remain his old cheeky self by still managing to let himself out his stable when I forget to latch the bottom bolt.